By nature, decision trees are powerful tools to showcase each “decision” along with its potential outcome. While already a recognized and respected way to create interactive guides, how-tos, and troubleshooters, decision trees are also a skillful platform for building, publishing and collecting survey data from both customers and internal employees. Why Use Decision Trees for Surveys? The general goal of a survey is to classify a population (who you are surveying) into complete sets, depending on their recorded responses. In this light, you can both represent the survey as a descriptive or analytical tool using a decision tree platform — it’s all narrowed down to the framing of the language used and in-depth paths created. 1. Build and implement surveys for recurring needs. For example, we use decision tree surveys for gathering information in a technical support request, and for when customers request demos. A little bit of background information goes a long way. 2. Include key information and helpful media. Depending on the survey at hand, it can be useful to embed documentation and/or visual media to help convey information better. Using visuals like photos, graphics, and GIFs, and adding relevant videos to your survey questions is a great way to communicate clear instructions and background information within little space. 3. Use logic to jump around complex paths. Decision trees were built to simplify complex situations, including the complicated logic jumps and survey paths that can arise when collecting information. Our multiple survey building tools (shown below) make it easy to create and visualize the survey paths, end-results, and any missed connections within the logic itself. Plus, you can start building in a spreadsheet if that’s easier to wrap your head around initially. 4. Perform A/B testing and optimize results. To get the most from your survey, you’ll need to perform A/B testing on areas such as how your survey questions are written, the medium from which the surveys are sent, and how many questions are included. Using Zingtree Logic Nodes, you can easily A/B test surveys and determine which options are getting the most traction. 5. Customize with themes and branded CSS. Having a seamless look-and-feel with your own company or organization’s branding is important to how a survey is received by customers. Zingtree allows you to import your own custom CSS file to fit the design you want perfectly or choose from a selection of decision tree themes to mix and match color and style possibilities. 6. Embed surveys anywhere you need them. 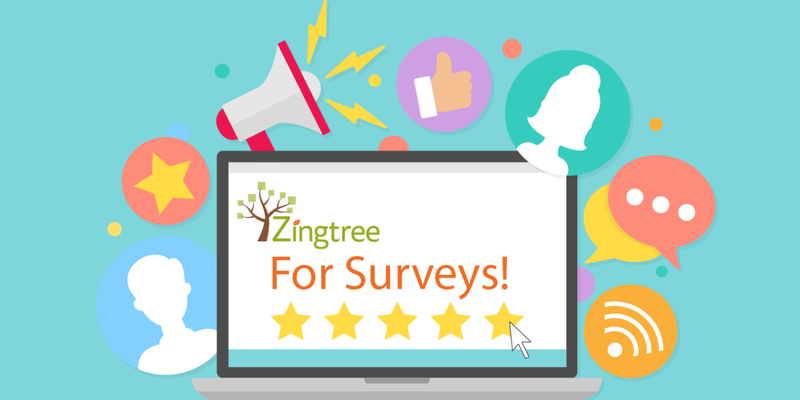 Once you’ve created a survey using Zingtree, you can easily publish and distribute it through several ways. Have a web page or WordPress-hosted site you need a survey embedded on? You can do that. Need us to host a survey that you can quickly link your customers to? You can do that, too. Creating a survey is easy with our toolkit, offering 3 easy-to-use options for creation. Spreadsheets Import: Use Microsoft Excel or Google Sheets to start building new decision tree surveys in your preferred spreadsheet program. Once imported into Zingtree, our platform’s editing and management tools can be used to refine and enhance your interactive surveys. The Wizard: The interface walks you through the decision tree building process while you provide the questions (and answers) that your end-users will see and navigate through. The Designer: Draw out a decision tree on one screen, where you’ll be able to create the nodes and their connections to see exactly how the tree will flow. Overview: A form-based option for creating one node at a time that consists of tools for refining your decision trees – perfect for content-heavy surveys. Check out this real live decision tree example, showcasing a basic customer satisfaction survey template. 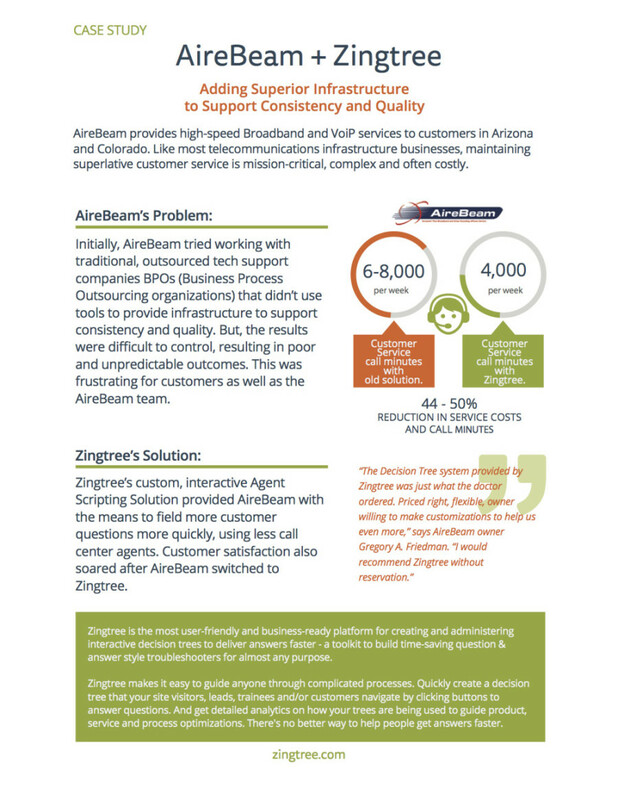 Zingtree makes it easy to build surveys, as well as question & answer style troubleshooters, scripts, sales filters and more to satisfy your customers, your agents and your business needs. Contact us to learn more or get started today!